Lawrence and Holo’s journey is nearly complete, with just a single stop left before they reach Yoitsu, the town of Lesko. Controlled by the Debau Mining Company and with mercenary bands gathering, just what will they find and what is the Debau Company planning to do with so many armed men? Is there anything Lawrence and Holo could do to stop their schemes? As this is a review of the 15th volume in the series, do expect some light spoilers in regard to early events, but I will do my best to avoid them. Having parted ways with Col, Elsa and Le Roi a week prior, the journey to Lesko has been on the quiet side, as Holo’s behavior toward Lawrence has changed and the new normal in their relationship has yet to be established after what happened in Lenos. As they enter Lesko they find not a town preparing for war, but one of cheer, peace and exceptional commerce. Everything is almost too good to be true and nearly the opposite of what they expected. Before they can investigate what is going on, they first head to the inn housing the Myuri mercenary band. Mercenaries bearing the name of one of Holo’s pack mates. It is strange to see an author move away from what has been one of the main draws of a series so late in the process, but that is what Isuna Hasekura does with Volume 15. Up to this point the banter between Lawrence and Holo has been one of the defining elements of the series and one of the things I love so much about it, so it was a little strange to find almost none of that in this volume. After the events that concluded volume 14, the relationship between our leads has changed and so too has Holo. No longer the briar patch, ever ready to throw venomous looks and sharp words at her hapless partner, this new softer Holo has Lawrence completely bewildered as he tries, unsuccessfully at first, to adjust to this paradigm shift in their interactions. But just as Lawrence comes to see the benefits of this new standard, so to did I, as the words shared between them may have lost their edge, but have gain more depth in their meaning. When Lawrence and Holo first enter Lasko, Holo is not in the best of moods and has been mostly silence during the week long trip, but her relationship with Lawrence is not the only cause of her discomfort and anxiety. That which is weighing on her mind is what will be found in town, answers to her homeland’s future and the first concrete evidence of her pack mates she has seen in hundreds of years. For how good the character and relationship development in this volume is, and I will reiterate that it is quite good, the emotion high point of the volume comes at the end of the first chapter, when Holo finally holds a message from someone she has not seen in a very long time. I will freely admit that I got misty eyed at this point, I couldn’t help it, the raw emotion and grief that was conveyed in those pages was too much to resist. This message comes by way of the young leader of the Myuri mercenary band, Luward Myuri, one of only two named characters outside of our titular pair in this volume, the other being the band’s strategist Max Moizi. With most of the time spent not just on our couple, but on our couple while they are alone in their room or while walking the streets of the town, not much is given to either of these new characters outside their use as vehicles of exposition and information on the town and region. The one real exception to this is Luward’s initial interaction with Lawrence and Holo, the previously mentioned emotional high point of the volume. As he is the one that gets to hand the message to Holo. A nice touch during this scene is Luward’s own shock at being the one to actually deliver it, as for him and his men it is part of the band’s founding legend and something they believed to be little more than myth. The genuine and earnest surprise was well done and added greatly to an otherwise stellar sequence. With so much of the volume dedicated to character and relationship development between the leads, there was very little time for any sort of business to happen. After the first chapter comes to an end the remainder of the volume is spent on Lawrence and Holo trying to discover what the Debau Company is up to and Lawrence trying is best to support Holo during this emotionally turbulent time. Through it all, the tension the series is known for is kept high, as town’s atmosphere is disconcerting to our leads until the scheme is revealed and as Lawrence finds a business opportunity that could change his life forever. Volume 15 felt like the long pause and the deep breath before the final plunge that will be Volume 16. Looking back, not much happened this time around. Lawrence and Holo did not get into any hijinks involving a crazy business deal, no one was trying to kill someone else over money and most of our time was just spent in conversation about the future. But it still contained a number of emotional moments and was an utterly satisfying read. Now I need that last volume, because the cliffhanger the last page throws at us is maddening. Spice & Wolf Vol. 15: The Coin of the Sun I was published by Yen Press on August 25th, 2015. Authored by Isuna Hasekura and illustrated by Jyuu Ayakura the series is 17 volumes in length and was published in Japan by ASCII Media Works under their Dengeki Bunko imprint. 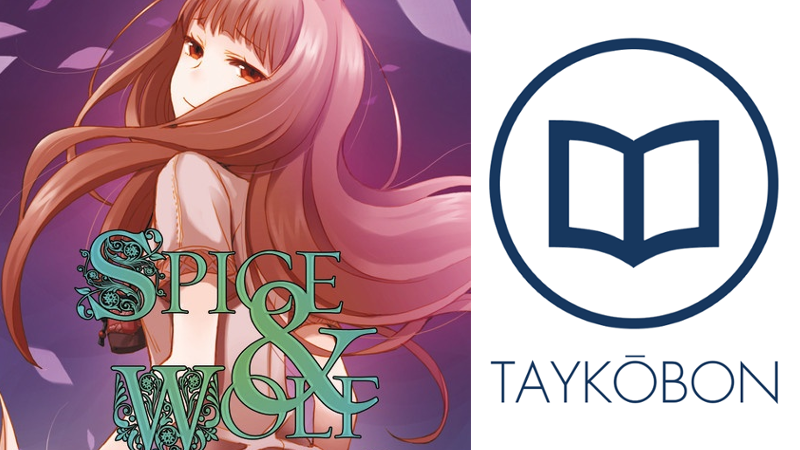 An anime adaptation of Spice & Wolf aired two seasons in 2008 and 2009, which correspond to volumes 1, 2, 3, 5 and 7. Spice & Wolf Vol. 16: The Coin of the Sun II is scheduled for release in English on December 15th, 2015. *Copy provided to Taykobon by publisher.